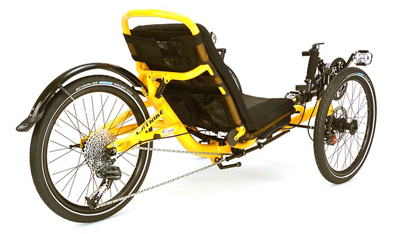 The Catrike 700 is a light, low, stiff trike built for speed without forgetting comfort. Like any Catrike, it is loaded with value, quality, and extras. 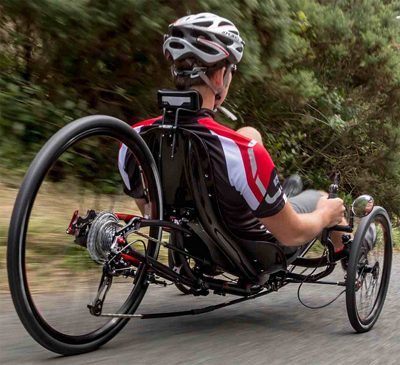 Heading over the top, we meet the Catrike 700, named for its 700c sized drive wheel. It sits ultra low with a flat-on-your back 25° seat recline and low riding chassis. (Get used to having the squirrels jump over you as you roll down the street.) But given that, it is awfully fast as the trike’s natural stability lets you lay into the pedals furiously and the super slick aerodynamics and Schwalbe Durano road tires keep you rolling efficiently. The 700 comes stock with the neck rest (you’ll appreciate it on this reclined seat, but you never need the neckrest as much as you think you will) and an upgrade Velocity rear wheel, and it does not come with a rear fender (though one can be installed). Most Catrikes have the same components on them, but the 700 comes with some distinctly upgraded parts. The rear wheel is a Zipp Course 30 deep section carbon wheel, attached to the frame with a 12mm thru-axle. This makes for a stiff rear end, giving less frame flex under hard acceleration and better tracking through fast turns. The hollow carbon fiber crankset gives better power transfer to your pedaling, and cuts weight. The disk brakes are all upgraded, and a rear brake has been added. This rear brake can serve as a drag brake for long descents, and it serves as a handy parking brake without the use of locking brake levers. The Avid FR-5 brake levers on the 700 have more adjustability and better modulation than the locking levers standard on other Catrikes, and it won’t give you the rattling noise that some locking brake levers give. The seat mesh is upgraded to add more cushioning at the sides, and at the top. In the past, long torso riders tended to feel the base of the neckrest against their backs, but that problem has been solved. The 700 isn’t for everyone, but those who like the 700 really like the 700. If you are used to road biking but need three wheels, then the 700 bears looking at. The 700 is in an “everything for speed” class that only appeals to a portion of our clientele. The 700 is designed to be fast and efficient. A low, aerodynamic body position and lightweight vertebrae-spaceframe put the rider it the perfect position to generate power and speed. The 700c Thru-Axle rear wheel offers excellent power transfer, and high gearing gives you the shifting options needed to reach your personal best. 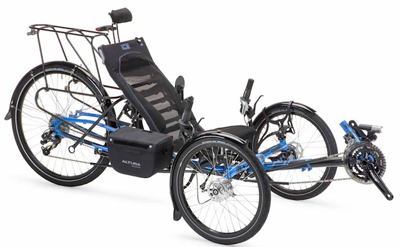 The central Catrike adjustable boom and one-piece frame display the same single-minded focus that drives the model of one of the fastest vehicles in any category. Simple and thoughtfully designed, 700 is engineered to move. This is how you know if you'll fit the trike. See our discussion here. If needed we can make it smaller. Brake Actuator - Microshift Index Thumb Shifter This is the brake lever for your parking brake, which lets you gradually engage the brake so you can use it as a drag brake.